There are moments in comics that will stay with you for as long as you live. Some for good and some not so much. This article is going to focus on those less than great moments. More specifically the moments that frustrate you to tears. Whether it be one of your favorite characters acting against the typical behavior that they are known for. Or just a massively bad plot twist that just makes no sense in the grand scheme. I am not going to guarantee that this article won’t get angry. In fact this article is being written to let out some of the rage that has built up over the years of reading comics. The inspiration for this article came from the amount of backlash that came from the reveal that Bobby Drake/Iceman from the past is gay. Even though the character has never been portrayed as gay in comics up until now. The fact that Bendis made Bobby gay doesn’t bother me. However, the explanation of why past bobby is gay and the Bobby in the present isn’t was extremely frustrating. Because the excuse that Bendis gives is that Bobby made a decision to not be gay, and that to me is insulting. Keep in mind that these are just the ones that I have personally read and all of them have taken place since I got back into comics. During the events of Fear Itself Cain Marko becomes possessed by one of the hammers of Cul, the Asgardian God of Fear. So in an effort to stop Cain, Magik and Colossus go to Cyttorak looking to have him step in. They argue that Cain is no longer working for Cyttorak, so he needs to step in and free his avatar on Earth from being controlled by another deity. Cyttorak agrees and removes the powers that Cul gave him. And in a twist Cyttorak also removes the Juggernaut abilities from Marko and gives them to Colossus. This leads to some really bad stories involving Colossus. Like Peter and Kitty breaking up because he can’t always control the Juggernaut force. 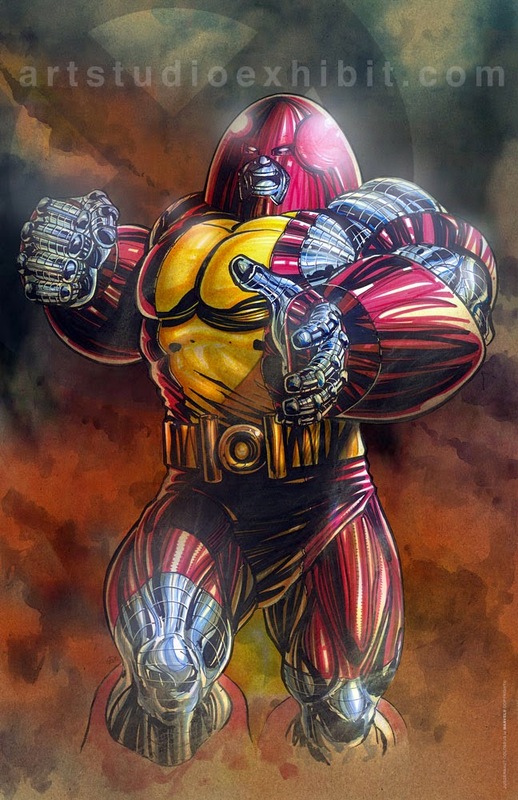 But one of the biggest downsides to Colossus becoming the Juggernaut was the costume change. It combined Colossus’ normal costume with the helmet and bracers of Juggernaut. When Avengers vs. X-Men started it had a lot of promise. It was going to be the event that “Changed the Marvel Universe”. And in some ways it did. After all AVX set up Marvel Now. Which has had a lot more good than bad. And up until about the halfway point AVX wasn’t doing too bad on delivering. Then Tony Stark built a device in an attempt to stop the Phoenix Force from reaching Earth, where it will possess it’s next host, Hope Summers. But the device doesn’t work the way it was intended to. Instead of getting rid of the Phoenix Force it broke it apart. And then the “ Kick The Raptor” moment happens. Instead of taking one host like it was supposed to it takes five. Leaving Cyclops, Emma Frost, Namor, Magik and Colossus all with the power of the Phoenix and referring to themselves as the “Phoenix Five”. That name is so amazingly cheesy that on a podcast the week they first debuted one of the hosts called them the “Phoenix Force Five” as a joke. Then in the next issue they were officially called the “Phoenix Five” and even the hosts of the podcast couldn’t believe the name. Sadly though the wheels fell off this particular wagon even further. Because you would think with all of the previous history Cyclops has with watching Jean Grey being consumed by the Phoenix, he would do everything he can to protect the world from the threat he and the other four avatar’s pose. Instead he and the others start forcing the world to change. And when Xavier goes to Cyclops to plead with him to see that what they are doing is wrong, he kills Xavier. I don’t care how far gone Scott would have been, I still don’t think he would have killed his mentor. And on top of that all of the characters that were possessed were poorly written from that point on. 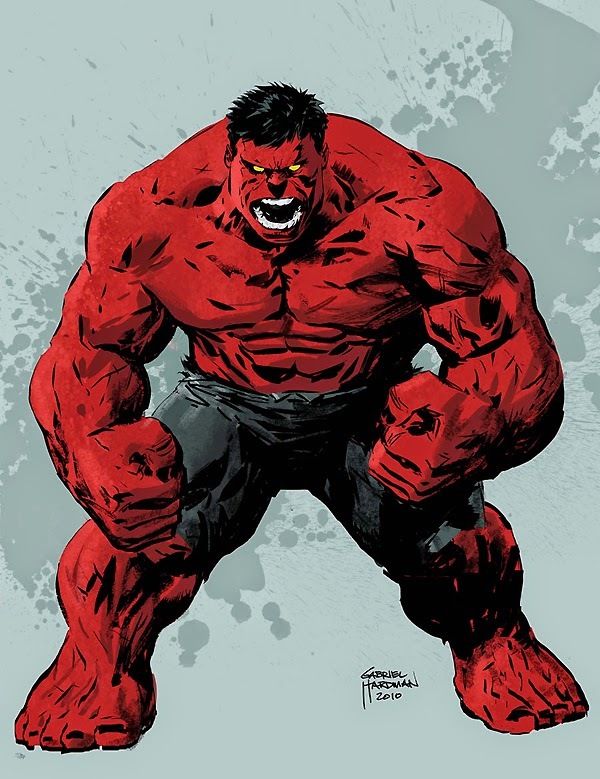 In 2008 Marvel decided that they wanted a new Hulk character, so they made the Red Hulk and kept his identity a secret. Jeph Loeb and Ed McGuiness were tapped to be the creative team to bring Red Hulk to life. And they did a pretty good job. Red Hulk tracked and stopped many of the classic Hulk villains all the while the mystery of Red Hulk’s identity was still protected. Now I can understand doing one maybe two arcs while teasing the identity, but Loeb kept the mystery going for around twenty issues. That is well over a year of comics where they just kept pushing the mystery of who Red Hulk really was. So when the reveal was finally made nobody really cared anymore. Then you throw in the fact that he was revealed to be General “Thunderbolt” Ross a man who was supposedly killed by Red Hulk early in the run. And how did they explain Ross being the Hulk and killed by the same Hulk? The ultimate Marvel death reset button, Life Model Decoy. The L.M.D. is a source of seething anger to me. Whenever Marvel wants to use the death of a character for a publicity stunt they know they can always use the L.M.D. to reset the status quo. But there were other pretty bad side effects of this arc, like the introduction of Red She-Hulk who is Betty Ross. Now I will admit that both Red Hulk and Red She-Hulk were somewhat turned around by Jeff Parker, and I liked the idea that Betty becoming Red She-Hulk allowed her and Bruce to actually have a relationship. But it still made no sense that either of the Ross’ would become a Hulk. I have never been the biggest fan of DC on the whole, but when DC announced they would be rebooting their universe in an attempt to streamline it for new readers I was optimistic. I was originally signed up for 8 or 9 books when the New 52 started and there were a few gems in the mix. But as the issues added up it was clear that DC may not be making the same mistakes as before. Instead they were making all new and in some places even bigger mistakes. Didio and Lee put a lot of trust in creators that were not to be trusted like Rob Liefeld. They had too tight of an editorial control over books with a lot of potential and could have really made DC a stronger publisher. Characters that were really liked were either mishandled or written out of continuity completely. But the biggest sin committed in the New 52 to me was the fact that the books that needed to a clean slate the most like Green Lantern didn’t change in the slightest. I have always been really interested in the idea of the Green Lantern books. But I have found that ever since Geoff Johns has had his meat hooks in the Green Lantern corner of DC universe the books have been way too convoluted and uninteresting. I even gave some of the books a look after Johns left the main book, but it still felt like the new writers were at the mercy of Johns control. Then you get into the whole fact that the reboot changed it so there have been a whole army of Robins in a short time of Bruce being Batman. And Tim Drake was never a Robin in current continuity. Hell his name isn’t even really Tim Drake. 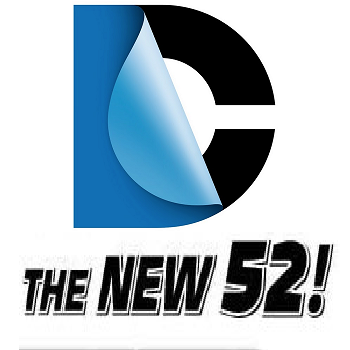 So I have to say that the New 52 has been a complete debacle in the long run. In 2011 when I was just getting really deep back into comics Marvel launched Fear Itself, a publisher wide crossover. It was written by Matt Fraction and was drawn by Stuart Immonen. It focused on the return of Odin’s brother Cul, who is the god of fear. Cul is released from his cell at the bottom of the marianas trench by Sin the daughter of Red Skull, who has been possessed by Skadi. With his release Cul, or the Serpent, drops seven hammers which transforms the people they are meant for into heralds of the Serpent. combined with Sin who also wields a hammer the six become Cul’s generals known as The Worthy. 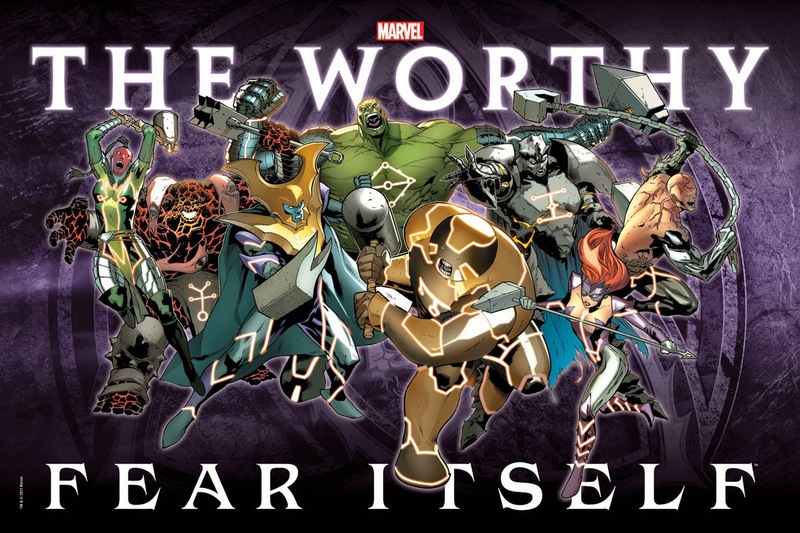 The worthy were made up of Hulk, Juggernaut, Thing, Absorbing Man, Titannia, Attuma and Absorbing Man. As the Worthy rampage around the world the amount of fear grows. And the more the fear spreads the stronger Cul gets. Now I am a huge fan of everything Asgard in the Marvel Universe. So when I heard the pitches for this series I was really excited. Fear Itself and Matt Fraction’s Mighty Thor were the first two books I ever put on my pull list at I Like Comics. And for the first 4 or 5 issues I really enjoyed the event. But then you get to issue six, and the problems start adding up. Problems like characters doing things that seem very out of character, and making giant logic and story leaps. Another large problem in Fear Itself was when the Thing cleared of his possession by Franklin Richards with a single touch of his hands. It bothered me because with that one simple throwaway moment take away all threat to the Worthy then just drop it like it is nothing. I mean if Franklin can do that why not just bring him in and let him wipe the other members? The excuse they give in the book is that Franklin made a promise to his parents to not use his powers anymore just a little before Fear Itself started. But if he makes the exception once why not just go whole hog? But that is just the beginning. By the time Fear Itself was done Bucky-Cap and Thor are dead, Paris is turned completely turned to stone by Grey Gargoyle, and Cul is locked away in the Asgard dimension and guarded by Odin. But then there were .1, .2, and .3 issues. And in those issues Odin Snaps his fingers and Paris is restored with no side effects, Thor is revealed to be still alive in a dimension between life and death, and Bucky is revealed to still be alive, and that the dead body everyone saw was actually a L.M.D. That’s right people the L.M.D.’s make another appearance on this list. This move makes me think that Marvel just had no faith in the series. Then there was also the fact that Ed Brubaker was originally supposed to be a co-writer on the event, but had to drop off for reasons that are still not clear. What saved the event to me on a small level was the Journey Into Mystery tie-ins and the 11 issue series that followed the main event series called Fear Itself: The Fearless. But the damage was already done. Thank you for reading this article. This really helped get some of the things that have bothered me since I got back into comics off of my chest. If you have any comments, questions, or suggestions for the site. Please leave them in the comments section. And as always….. Keep Reading Comics Fans!!! !